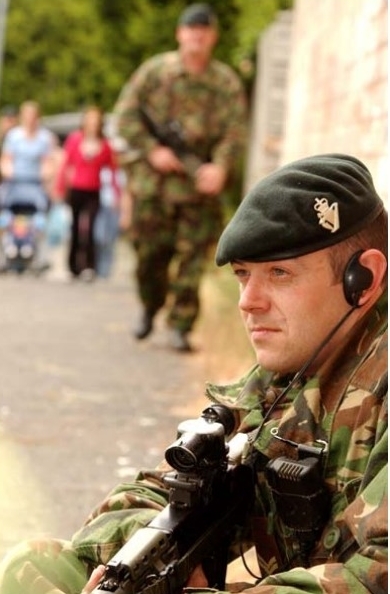 The support by the United Kingdom's Armed Forces for the Police Service Northern Ireland, known as Operation BANNER, ceased at midnight on 31 July 2007. At the peak of the campaign in the summer of 1972, 28,000 soldiers were deployed. Well over 250,000 members of the Regular Army served there during the campaign, as well as many tens of thousands in The Ulster Defence Regiment and later, the Royal Irish Regiment's Home Service Force. To read a United Kingdom Ministry of Defence account of the operation, please click on OPERATION BANNER - AN ANALYSIS OF MILITARY OPERATIONS IN NORTHERN IRELAND. To return to the Virtual Military Gallery, please click on your back browser.